Post: Gaurav Akrani. Date: 2/11/2011. No Comments. Label: Banking. 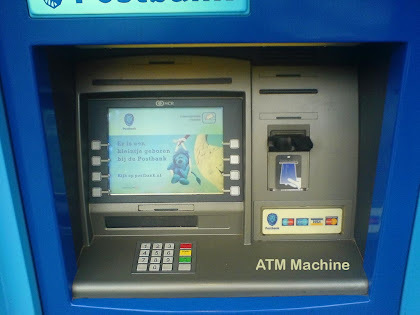 ATMs are electronic machines, which are operated by a customer himself to deposit or to withdraw cash from bank. For using an ATM, a customer has to obtain an ATM card from his bank. The ATM card is a plastic card, which is magnetically coded. It can be easily read by the machine. To operate an ATM card, the customer has to inset the card in the machine. He has to enter the pass word (number). If the authentication or pass word (number) is correct, the ATM permits a customer to make entries for withdrawal or for deposit. On completion of the transaction, the customer's card is ejected from the ATM. ATMs provide service round the clock. The customer can withdraw cash upto a certain a limit during any time of the day or night. ATMs provide convenience to the customers. Now-a-days, ATMs are located at convenient places, such as at the air ports, railway stations, etc. and not necessarily at the Bank's premises. It is to be noted that ATMs are installed off-site. (away from bank premises) as well as on site (installed within bank's premises). ATMs provide mobility in banking services for withdrawal. 3. ATM reduces the workload of bank's staff. ATMs reduce the work pressure on bank's staff and avoids queues in bank premises. ATMs provide service without error. The customer can obtain exact amount. There is no human error as far as ATMs are concerned. ATMs are of great help to travellers. They need not carry large amount of cash with them. They can withdraw cash from any city or state, across the country and even from outside the country with the help of ATM. The customer also gets brand new currency notes from ATMs. In other words, customers do not get soiled notes from ATMs. Most of all, ATMs provide privacy in banking transactions of the customer.